The traditional snack dish called nilupak is one of the delicious treats that can be made from cassava (kamoteng kahoy). With its sweet and distinct taste coming with much needed carbohydrates, it can be a perfect snack or dessert. ‘Nilupak’ is a Filipino word that means ‘mashed’ or ‘crushed.’ The name is just logical: it is made of mashed cassava mixed with all other ingredients to create that sumptuous and irresistible dish. Although it is usually made of cassava, some people prefer nilupak made of plantains (saba variety of banana) or sweet potato. The taste and texture may differ depending on the main ingredient used. But the procedures and all other ingredients could exactly be the same whether you use cassava, plantains, or sweet potato to prepare your own nilupak. The traditional way of making nilupak is still the simplest and most recommended because it produces the best product. However, a traditional 'husong' or large mortar and pestle made of wood is required as it would mix all the ingredients very well. Using it would also bring about the ideal texture and softness to the dish. Making nilupak can be a promising business idea for home-based food entrepreneurs. That is because consumers can’t easily resist it and it is not easily found in the market. How about taking orders or selling it to other food vendors? You can easily make a home-based business out of making delicious nilupak. Here’s the simple and traditional recipe for it. 1. Peel cassava before boiling to make it soft. 2. Prepare the husong. Put cooked cassava into it. Start pounding to mash it. 3. Put all other ingredients (sugar, condensed milk, grated coconut, and peanut butter). Add a pinch of salt. 4. 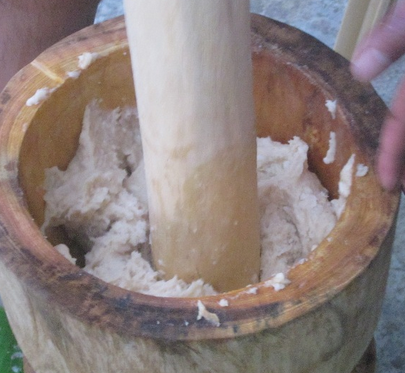 Keep on pounding, mixing nilupak occasionally using wooden spoon. Your nilupak is well done when all the ingredients get completely mashed (this may take about 10 minutes to 15 minutes). Serve it over greased banana leaf and top with margarine.